Luxury Willerby Solstice caravan for hire on Rose Bank at Primrose Valley Holiday Park with large veranda and sea views. This caravan is one of the few which has the benefit of sea views and is located in a quiet cul-de-sac though still within easy reach of all of the facilities. It also has a wide open grassed area at the side of the caravan for the children to play in safety. There is a separate patio area and the caravan itself is furnished to the highest of standards. Fully equipped kitchen that includes a gas oven (brand new for 2017 season), microwave, fridge, toaster, kettle as well as crockery and cutlery. In the lounge we have a LCD TV with Freeview, CD player and a Play Station 3 with a range of games. There are also various games, DVDs, Blu-Ray Discs and books to keep the family entertained when not enjoying the fantastic facilities offered by Primrose Valley. 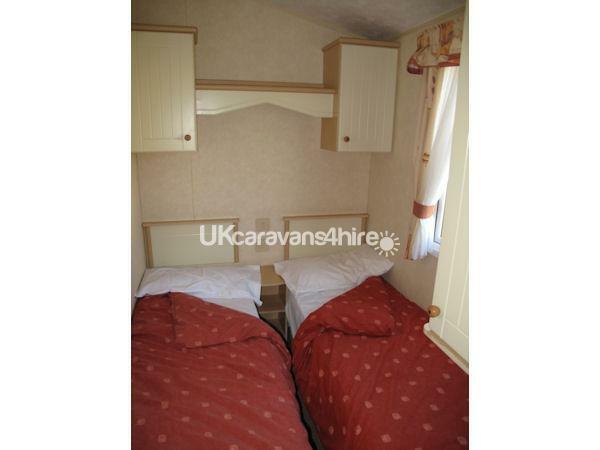 The caravan has 1 double bedroom and 2 twin bedrooms, allowing six people to stay comfortably. The bathroom has a double shower cubical and basin. There is also a separate toilet and basin. The caravan has mattresses replaced to be the same quality as what you would use at home opposed to the cheap budget ones often found in caravans. 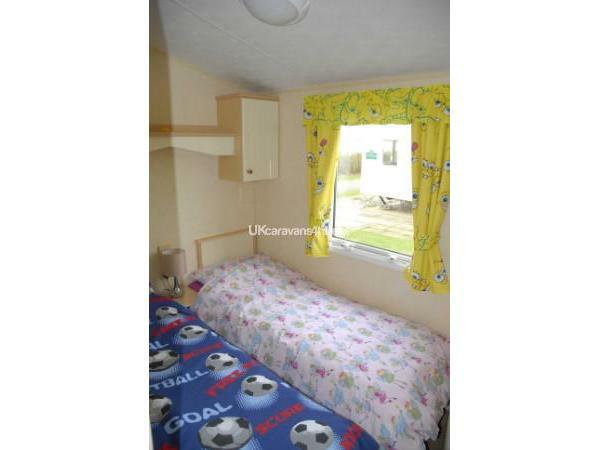 Central heating and double glazing give this caravan a warm and cozy feel. On the large veranda there is patio furniture allowing you to enjoy the sea views. There is private parking next to the caravan for 2 vehicles. All gas and electric is included in the quoted price. Bed linen is not included in the price. Bring your own or hire direct from Primrose Valley Holiday Park reception. Site entertainment passes are not included. These can also be ordered and purchased directly from Primrose Valley Holiday Park reception. Short breaks may be available on request, however at peak times (school holidays and all of July & August) we will only be able to offer full weeks. £100 Required immediately to secure booking. This £100 is non refundable should you cancel your booking (As per the Terms & Conditions of booking). Final Payment to be made within eight (8) weeks of holiday. An additional £100 security bond will be required with your final payment. This will be refunded within 7 days of your departure, once the caravan has been inspected for damage. Full Terms & Conditions will be sent to you along with a booking form, once you have confirmed your interest in a holiday date. Lovely caravan. Everything you need is there. Lots of crockery, cutlery, pots and pans, including kids plastic plates etc. Some outdoor kids toys and beach toys. A selection of books and board games also in the caravan. There is also a high chair and bed guard. Can't fault anything. Would be happy to come back. I stayed in Mike’s caravan with my 3 young children over Easter. The caravan was great, really well equiped with games and toys for the kids. Lovely and clean. Wouldn’t hesitate to recommend and would definitely return. We had a lovely holiday in this caravan, it had everything we needed and more! Not too far from the entertainment complex.. would definitely stay again! We had such a lovely time at mikes caravan, my children are a little bit older and we were worried when we had a few rainy days that they would get bored, but the caravan is so well equipt with everything to suit all ages, PS3, games, books, cards etc there was never a dull moment. It has such a homely feel, it really felt like home from home and we were all rather sad when it was time to leave. Mike responded to any queries/questions we had very quickly and if we choose to go back to primrose valley again we will definitely get in touch with him before anyone else to check his availability, best caravan we've stayed in by far. What a nice clean and well equipped caravan, everything you need for a great stay, great big decking at the front for morning sunshine. Everyone loved it. 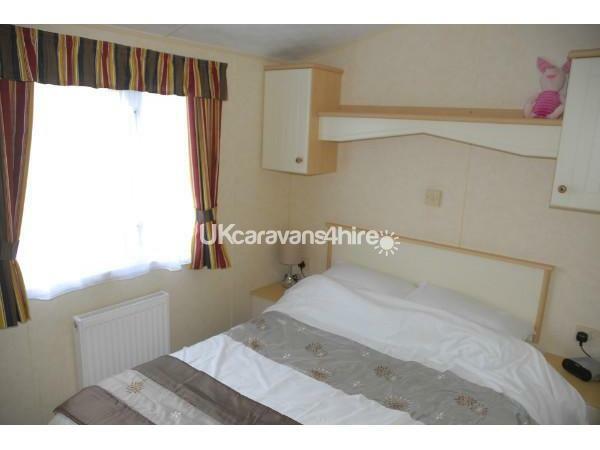 This is a lovely, homely and very well equipped caravan with little extra surprises such as a bed guard, toys for the kids and family comforts that you just don't get when booking the generic holidays through big companies. Booking was easy; Mike was very quick at replying to any queries and making sure we had everything we needed. Will definately look to book again.